A few days ago, James Mirtle of the Globe and Mail brought up one of the first significant shifts in tactics under the Mike Babcock regime in Toronto. Parenteau playing as fourth forward on Leafs PP and scores. New look for Toronto man advantage, run by assistant coach Jim Hiller. While the change may be surprising to some fans, particularly given the lack of depth in the Leafs forward corps, it shouldn’t be altogether unexpected. Detroit was one of the top users of the 4F-1D approach last year, sending out 4 forwards for more than 85% of their total man-advantage ice time over the course of 2014-2015. Why would the Red Wings use the 4-forward approach so frequently? While it’s possible that they read my earlier piece on the subject, it’s more likely that they simply noticed the general success of the 4-forward approach. In the graph below (where the 14/15 Leafs are highlighted in red) each team’s overall powerplay success rate is graphed against the percent of their total powerplay time that was given to a 4F-1D setup. While the relationship may be somewhat weak, it’s also clearly positive. Even though we know nothing about the teams in question (i.e. where they finished in the standings, who played on their powerplays, if Randy Carlyle was their coach for a portion of the season), we can see that in general the teams who used 4 forwards more frequently also converted on their powerplay chances at a higher rate than those who stuck to more traditional approaches. So where does the upside of the 4F-1D setup actually come from? There are two offensive areas that we could see an increase in if the 4-forward powerplay is actually beneficial: teams may be generating more shot attempts (higher Corsi For per 60), or they may be more likely to convert on the shots that they do get (higher shooting percentage). In the ideal case, of course, both numbers should increase and when we look at the data over the past 6 years, we see that’s actually what happens: teams see a distinct jump in both shot generation and shot conversion when they play with 4 forwards on the powerplay. The advantage to the 4-forward approach here is pretty clear – the increase in Corsi For works out to more than 10 extra shot attempts per 60 minutes of powerplay time, or about an extra shot attempt every 3 powerplays, and on top of that each shot on goal goes in at a significantly higher rate. Neither of these facts should be shocking to us – forwards generate the majority of shot attempts at even strength, and tend to be better shooters at 5v5, so it’s not surprising that playing with an additional forward would have clear offensive benefits. What we really need to check though is the effect on shorthanded opportunities against, and whether teams with 4-forwards are exposing themselves defensively by playing with one less defenceman when they’re up a man. When we look at the defensive numbers, it becomes quite clear that there are risks to the 4 forward approach. While the increase in shot attempts against is modest, the decrease in save percentage is actually fairly substantial. Goaltenders playing behind 4 forwards on the powerplay stop shots on goal at about the same rate as goaltenders killing a penalty, which is obviously not a good thing. Teams that play with 4 forwards are definitely exposing themselves to higher percentage opportunities defensively, whether they be odd-man chances or offensive rushes against a winger not used to playing the point, and these plays result in more shorthanded goals than we’d otherwise expect a team to see. These goals against are the plays that everyone remembers when they think about a forward playing the point on the powerplay – I still recall Jason Pominville going around Daniel Alfredsson in overtime of the 2006 Eastern Conference Semi-Finals to end the Sens playoff run that year. These are also, unfortunately, the kinds of memories that tend to deter coaches from taking the chance of using 4 forwards on the powerplay. It’s understandable that few coaches want to expose themselves to criticism of their tactics, but what we really need to concern ourselves with is the total net effect of playing with 4 forwards. The question we really want to ask is whether teams post a higher goal differential with 4 forwards and 1 defenceman, or with a standard 3 forward-2 defender approach. After all, it doesn’t matter if we’re giving up more goals if the boost in offense outweighs the defensive costs. 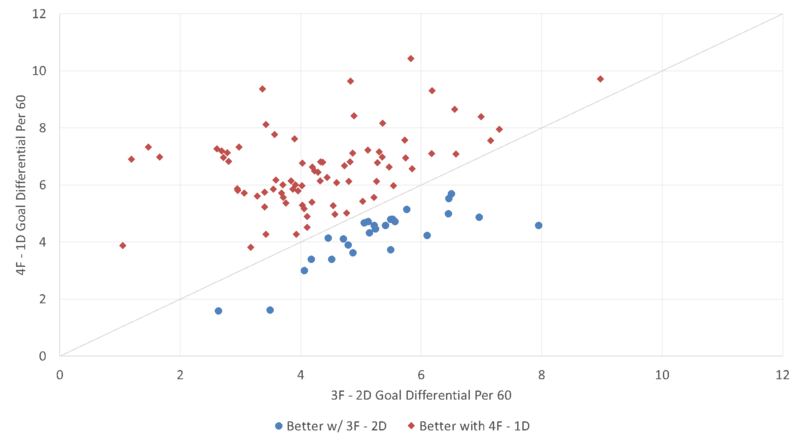 And when we look at the data, the benefit of the 4-forward approach is quite clear – when teams play with 4 forwards on the powerplay, they score more than an extra goal on roughly every 30 or so powerplays they receive, which works out to nearly 8 extra goals over the course of a season, or 1.25 wins. That’s a fairly large benefit for a simple tactical change which almost every team can use. This benefit becomes even more clear when we compare teams that spent a significant amount of time using each approach over the last 6 years. Each point in the graph below represents one season for a team that used both a 4F-1D and 3F-2D setup for at least 200 minutes each over the past 6 years. All the points in red are teams for which the 4F approach resulted in a better goal differential than the 3 forward approach, while the points in blue are those that were better off with a standard 3F-2D setup. There are a 2 things to note here: first, the 4F approach is better for the majority of clubs. More than 80% of the teams performed better with 4F and 1D than they did with 3F and 2D. The second thing to notice is how far the red points are in general from the diagonal line (which is the breakeven point between 4F-1D and 3F-2D). Most of the red points are much further away from the breakeven point than the blue points are, suggesting that the boost was non-negligible even within teams. 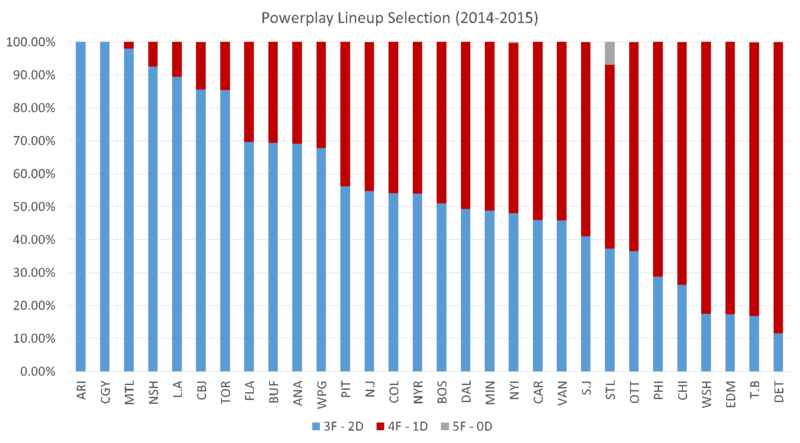 While some of the difference that we see may be explained by differences in the composition of powerplay units (i.e. 1st units may be more likely to use 4 forwards than 2nd units), the change for the majority of the teams is still quite staggering – the benefit appears to persist even when we take into account differences in coaching tactics between teams. So why are coaches hesitant to try the 4 forward approach? For some teams, it may be that they feel their defencemen are strong enough on their own and that replacing them with a forward would be a step back. This would definitely make sense for clubs like Montreal and Nashville, both of whom ranked near the bottom of 4F usage last year, who have players like PK Subban and Shea Weber to rely on. But for a lot of other teams it’s likely driven more by a fear of being blamed for failure more than anything else. Coaches don’t want to be seen as the reason for a goal against, and going against the status quo is certainly a prime way of putting yourself in the crosshairs of local media when things go wrong. Unfortunately, this seems like a prime example of coaches acting too passively, and preferring to not lose rather than doing everything they can to win. The question is whether this reluctance to play for the win extends to other areas – you could certainly make an argument that teams are too passive when down a goal late, and switching to a 4F-1D approach at 5v5 may be a good tactical precursor to pulling the goalie. While the data unfortunately doesn’t exist to test this hypothesis, trying out unconventional tactics like this presents an interesting opportunity for coaches to gain a competitive advantage. 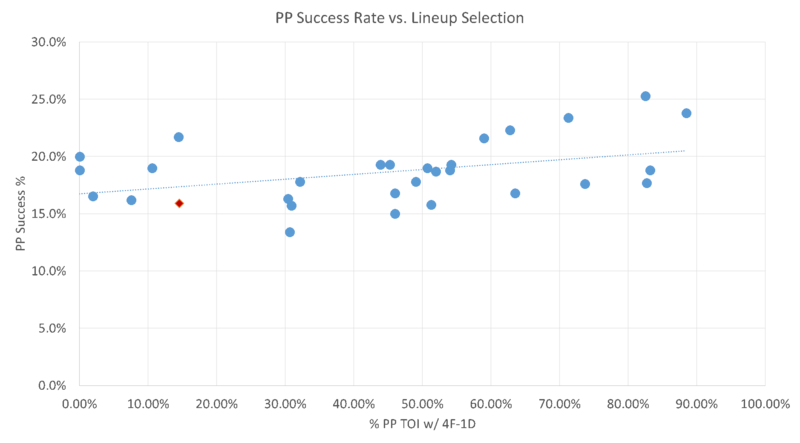 While that idea may be a bit of a stretch for most bench bosses, the results here clearly suggest that a 4F-1D approach has a definite positive impact, and that the established wisdom may not always lead to the best results in today’s NHL.